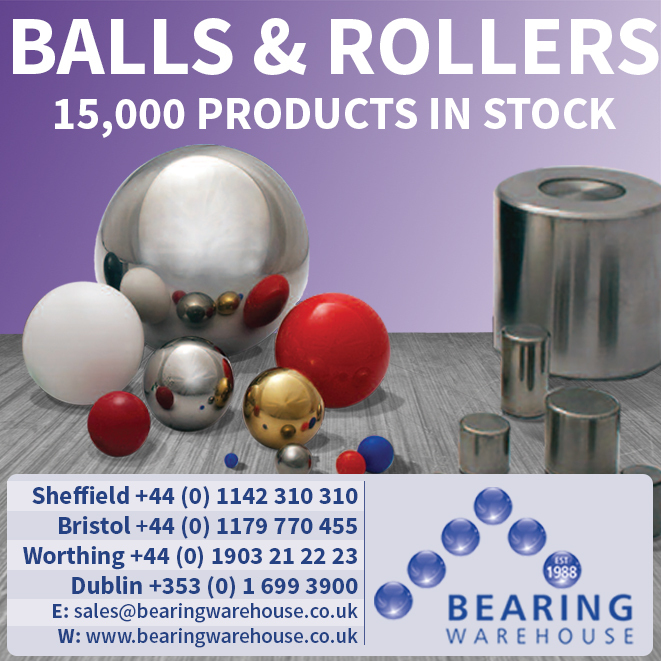 Bearing Warehouse Ltd have unrivalled stocks of loose balls and rollers and supply a multitude of customers in the UK and Worldwide. Our extensive product knowledge and links to factories all over the world enable us to provide our customers with a vast range of sizes and materials at excellent prices with short lead times. Our dedicated Ball and Roller Division based in Worthing, West Sussex are on hand to assist you from the enquiry stage right the way through to delivery. We can even offer special production services where non standard balls are required. We can also provide certification such as material, 3.1 Inspection certificates and where applicable mill certification. Below is a list of just a few of the materials, sizes and grades we offer. Martensitic stainless steel balls, they are characterized by good mechanical hardness, corrosion resistance, wear and abrasion resistance. Balls are provided in the passivated state. Martensitic stainless steel balls, they are characterized by having excellent mechanical hardness, wear resistance, surface finishing, narrow dimensional tolerances. For that reason this type of steel is frequently used in precision devices. Balls are provided in the passivated state. Austenitic stainless steel balls with a higher corrosion resistance with respect to AISI 304 balls. They show good toughness. AISI 316L has lower maximum allowed carbon content (maximum 0,030%). Balls are provided in the passivated state. These balls are widely used in the medical industry. Not hardened austenitic stainless steel balls, they display good mechanical characteristics, toughness and corrosion resistance. AISI 304L has a lower maximum allowed carbon content, AISI 302 better mechanical characteristics. Balls are provided in the passivated state. Brass balls show fairish mechanical characteristics, good corrosion resistance, and excellent electrical properties. They generate low frictions. Balls are provided in the passivated state. Plastic balls are available in materials such as Nylon, Delrin (Acetal), Polypropylene, Torlon and Teflon (PTFE). Plastic balls offer above all the advantage of being very light. They are also highly resistant to heat, oxidation, abrasion and are non magnetic. Each Plastic material has different characteristics. Assorted colours available on some materials. The most common Ceramic balls available are Alumina Oxide (Al2O3), Silicon Nitride (Si3N4) and to a lesser extent Zirconium Oxide. These balls differ in properties and benefits. Silicon Nitride offer very high resistance to wear and abrasion and weigh 60% less than steel. They are also resistant to corrosion and are anti magnetic. These balls are efficient at temperatures in excess of +1400°C and are designed for applications subject to great stress. Alumina Oxide balls offer excellent resistance to abrasion, high temperatures and most corrosive agents. They are not recommended for processes in contact with hydrochloric and hydrofluoric acid. Balls of this material are used for applications requiring extreme hardness and resistance to wear and abrasion, hard shocks and impacts. The two main types of Glass balls offered are Soda Lime (Crystal Glass) and Borosilicate (Duran-Pyrex). Soda Lime balls are resistant to high alkaline solutions and are used mainly in applications not subjected to strong mechanical shocks. Borosilicate balls offer higher precision and are used widely in the Pharmaceutical industry. These are carbon balls that are not subjected to the heat treatment process. These are widely used in non precision applications and more commonly as catapult ammunition. There are many different types of materials that are not listed above. Feel free to contact us should you need a material that is not listed. We have access to many specialist suppliers worldwide who can supply balls in many different non standard materials.